Here’s a selection of what we think are the best events in Croatia taking place in 2019. We add to this list all the time (as new events or additional details are announced), so do check back regularly! If there’s anything you think we’ve missed, then do please email us. Most Christmas and Advert Fairs in Croatia do still run until early January – so if you’re in Croatia this month, check locally to see what’s on! On Friday 1st February 2019, from 6pm to 1am, the “Night of the Museums” takes place at various towns and cities all over Croatia. Each year, over 200 museums, galleries and other similar institutions across the country in 100 cities and towns take part; with around 300,000 people visiting Museum Night, it’s a very popular event. Entry to all these places is free, so you can enjoy their fine exhibits. Many also host additional workshops and other events on the night. You can find some further details at the Croatian Museum Association website. The Festival of St Blaise (Dubrovnik’s patron saint – Sveti Vlaho in Croatian) takes place each year on 3rd February and includes a number of ceremonies in which the people of Dubrovnik pay their respect to the saint. There are also a number of linked events taking place in the preceding days and weeks. 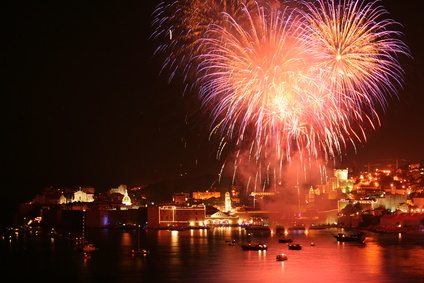 The same day is also considered a “City of Dubrovnik Day”, with certain events also being held to celebrate this. February is carnival month in Croatia (and elsewhere in the world! ), with many celebrations taking place in various towns and cities. One of the largest events is the Rijeka Carnival; its celebrations officially taking place from mid-January to early March, including parades and concerts, exhibitions and balls. The Rijeka Carnival easily attracts over 100,000 spectators, making it one of the larger carnivals in Europe. This year, the main International Carnival Parade in Rijeka takes place on the 3rd March 2019. Zagreb Dox is an international documentary film festival, held from 24th February to 3rd March 2019. Taking place at the MoviePlex cinema in the Kaptol Center, there are several themed programs as well as a competition for the best documentary. The Tuna, Sushi and Wine Festival will be held in Zadar from 22nd March to 1st April, with exhibitions, workshops, lectures, a main square gastro event and special tuna options at participating restaurants in the town. 100 Miles of Istria (12th – 14th April 2019) is an endurance event that actually contains several races over the weekend – a tough, 100 mile trail; the ‘easier’ 110km one; and a more ‘manageable’ 65km trail. Anyone can enter any of the races – if you’re brave enough! The Tour of Croatia is only a few years old, but already popular with spectators and competitors alike. Taking place in April each year, the Tour has stages throughout Croatia. Check the website to see where exactly the cyclists will be competing, and then head out and watch if you happen to be there! There’s also some stunning views of the country if you’re watching on TV (Eurosport have coverage). The Festival of Flowers is held each year in the cellars of Diocletian’s Palace at the beginning of May, usually with a high number of exhibitors showing displays to a particular theme. A gorgeous visual event, be sure to check it out if you’re in the city this month! Split’s patron saint, Saint Domnius (Sveti Duje in Croatian) is celebrated with a feast day held each year on 7th May. The Vinistra exhibition in Porec allows wine-lovers to come and sample local specialties, with olive oils and brandies also featured. Over 100 exhibitors normally show their collections of wines, oils and spirits; this year’s event will be on from 10th to 12th May 2019. Events on Korcula include a celebration of the times of Marco Polo (who was – supposedly – born on Korcula) at the end of May, when the streets of Korcula Town are decorated to look like a 13th century town. Wine Day (“Open Wine Cellars Day”) allows people to tour the wineries of Istria, conducting tastings (and purchasing wine too!). It is normally held on the last Sunday in May – check locally for details and to see which wineries are taking part. Lake Jarun is home to the INmusic Festival, a three day music event in this pretty setting in southwest Zagreb, with a host of international bands and stars performing. Held 24th to 26th June this year, read more on our guide to the Festival here. The line-up this year includes The Cure, Foals and Frank Turner. “Porec Summer” will take place starting from mid-June (normally to September) with a wide variety of events including music, dance and more. Check locally for up-to-date listings. Hideout Festival returns this year from 1st to 5th July 2019, held in the open air clubs of Zrce Beach in Novalja on the island of Pag. The Pula Film Festival will be in its 66th year in 2019, making it the oldest festival of its kind in Croatia. Both Croatian and international films are shown at various locations in Pula, including in the stunning amphitheatre (the Arena) in the town. The Festival is on from 13th to 21st July 2019. July and August sees an absolutely cracking line-up of music festivals take place on this part of the Croatian coast – the way these festivals are lined-up (all in the same location of Tisno), you could get almost a month and a half of solid partying! They are the Love International (3rd – 1oth July 2019) and SunceBeat (24th – 31st July 2019). Rabska Fjera is a famous medieval-style summer festival on the island or Rab – with plenty of re-enactments and authentic costumes – that takes place every July. The 29th Croatia Open ATP Tennis tournament will take place from 12th to 21st July 2019 in Umag. A clutch of top men’s players, including some of the top Croatian players, take part. There’s also a number of other events taking place that accompany the event, making it quite a fun tennis tournament to attend! The Split Summer Festival runs for about a month from mid-July to mid-August. Much like the Dubrovnik Summer Festival, this one features open-air theatre, music and dance performances at various special venues around the city, including in and around Diocletian’s Palace. The famous Dubrovnik Summer Festival starts mid-July and runs until the end of August. Each year, the Festival includes theatre, opera, music and dance events at various open-air venues around the city. Kazaliste Ulysses (Ulysses Theatre), co-founded by famous Croatian actor Rade Serbedzija, is situated on Veliki Brijuni island (of the Brijuni islands) and runs each summer with some wonderful plays – past seasons have seen Hamlet and King Lear. The Theatre is open and holds performances from mid-July to mid-August each year. Another film event in Istria is the well-established Motovun Film Festival. Although held in a small (but very pretty) hilltop town in inland Istria, the event is considered one of the premier film festivals in Croatia. A variety of features from across the world are shown, from documentaries to full-length films. The 13th Millennium Jump will take place in Zadar on 27th July 2019, with locals and other willing participants gathering on the waterfront and then jumping into the sea at the same time! Around 1,500 people take part each year; here’s a video from In Your Pocket explaining the event in more detail. Fun to join in with if you’re there! On the first weekend of August each year, a very famous and historic horseback tournament takes place in the town of Sinj, near Split. Now in its 302nd year (that’s not an error!) the Sinjska Alka (or Sinj Alka) sees competitors on horseback armed with lances, aiming to hit the inside of a metal ring (the alka) with points awarded according to which part of the ring they hit. The Sinjska Alka was entered onto the UNESCO Intangible World Heritage List in 2010 (read more on the UNESCO site), and is well worth attending if you’re in the region in early August. The wonderful Full Moon Festival will take place on the Riva in Zadar in mid August. Locals turn off their lights, and head to the candlelit waterfront to enjoy music and food. A must if you’re in the region at this time of the year! Dimensions Festival takes place in Punto Christo, Pula from 28th August to 1st September 2019. The ‘little sister’ of Outlook (below), Dimensions has grown into a strong event in its own right with world class spinners and breakthrough artists. Outlook Festival takes place in Punto Christo, Pula from 4th to 9th September 2019. Labelled as “Europe’s largest bass culture and dubstep festival”, the event is celebrating its 12th year this year; there’s always a spectacular opening concert in Pula’s Arena! Starting in September, though mainly taking place in October and the beginning of November, the “Day of Truffles” events are actually a succession of truffle-themed days taking place every weekend at various towns in Istria. Check locally for planned events, and enjoy tasting various food and dishes flavoured with truffles. The Split Film Festival will take place from 18th to 25th October 2018, showcasing new films from across the world from a variety of categories, themes, genres and styles. Marunada is a festival devoted to chestnuts – sampling chestnut delicacies & chestnut liquers, collecting chestnuts…and plenty of games and sports events too! Marunada takes place in various venues this month, mainly near Lovran in Istria. The Good Food Festival in October (14th to 20th November) offers food and drink tastings, culinary walks, workshops, kids events and more. Mid-November sees Theatre Night in Croatia (having expanded, it also takes place in several other neighbouring countries). Somewhere along the lines of 80 venues in more than 30 towns and cities in the country participate, welcoming over 40,000 attendees. Theatres will hold free (or cheaper) performances, with additional workshops, tours and similar. Almost all towns in Croatia, however small, will have festive decorations put up to celebrate Christmas. Some, especially the larger towns and cities, will have Christmas fairs, ice skating rinks and other events to celebrate the time of year. This is also true for New Year’s Eve – head to the main square of the town/city you’re in, and you can probably enjoy a free evening concert until the early hours, which normally has a pause for fireworks at midnight!